Our good customer Gary recently took delivery of his new Blue Mood Series 18 watt reverb 1×12 combo from the Richards Amplifier Company – Australia. As you can see in the photos, this combo is just stunningly presented in a cabinet built from a central section of Tasmanian Blackwood, with Bird’s Eye Maple edges. 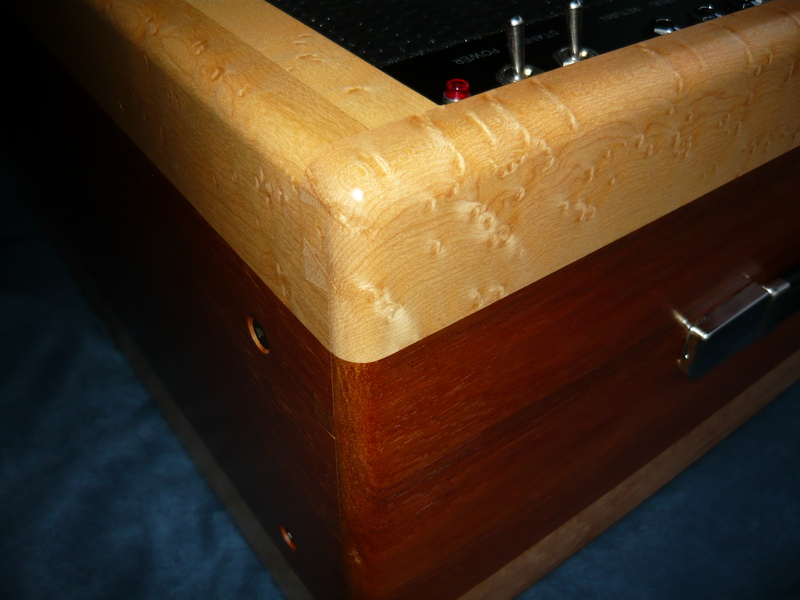 The 1×12 speaker baffle is furniture-grade Fiji Cedar ply, although this is covered in a plain black grille material for contrast. The exotic timbers cabinetwork is done for us by our good friend and colleague, Mr Peter Davies, who is formerly of the NSW Central Coast, but now resides in Melbourne. This combination of Tassie Blackwood and Bird’s Eye Maple represents the most attractive combination for our amps we have achieved so far, although Peter tells us he is working on something even more eye catching !?!? 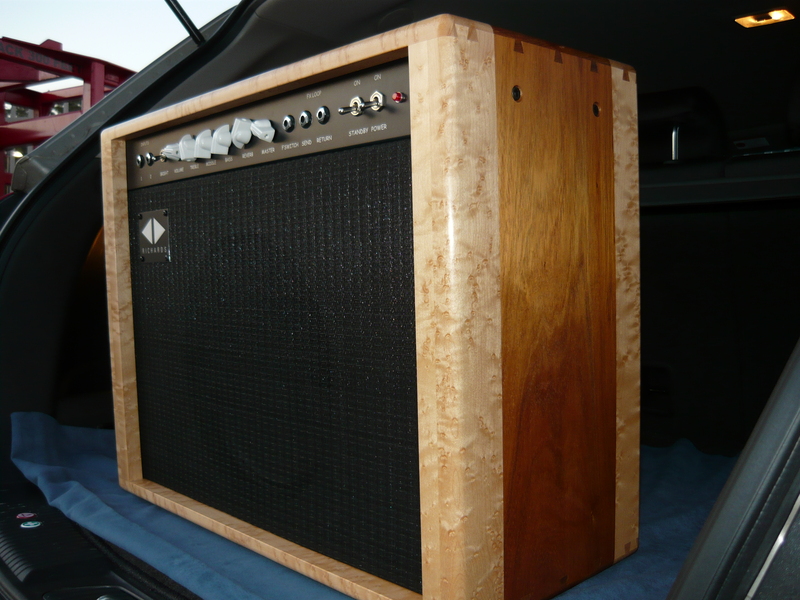 Any of the amps and speaker cabs that appear on our blog site can be ordered with conventional “tolex” coverings, available in a variety of styles and colours, over a furniture-grade plywood cab. 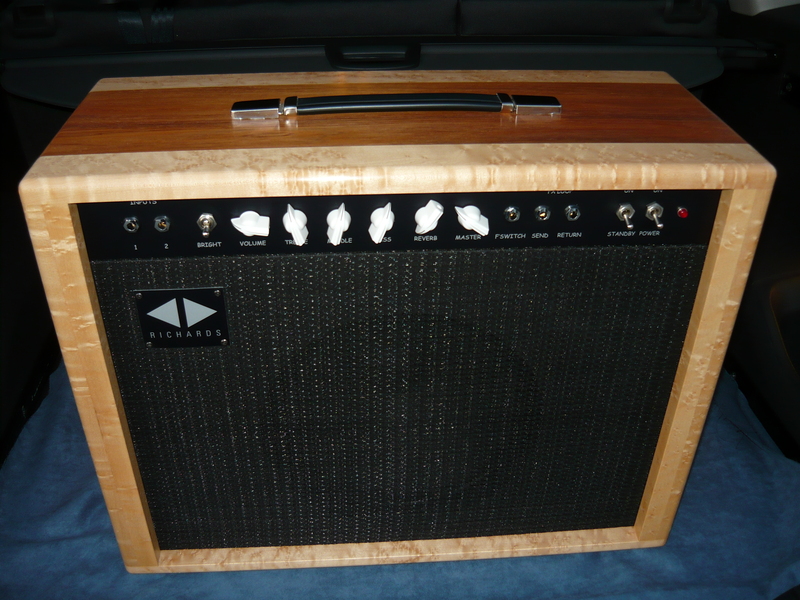 This particular 1×12 combo was supplied loaded with a Celestion 70th Anniversary Series G12H30, a speaker that sounds very good with most amp designs. 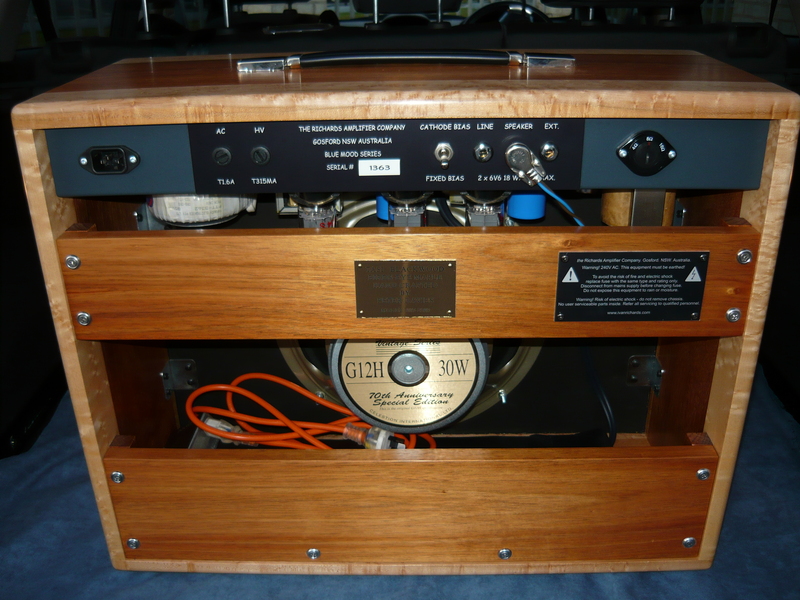 We don’t imagine that Gary will be taking this amp out on the road, it’s more the kind of amp that you enjoy in the privacy of your own home. The combo features a pair of high impedance inputs, a bright switch for guitars with humbucking pickups, volume, treble, middle, bass, reverb and master volume controls, footswitch jack and send & return jacks for the passive FX Loop. So – what makes this 18W combo different from the other models in the Blue Mood range ? For one thing – this model is all about the reverb. 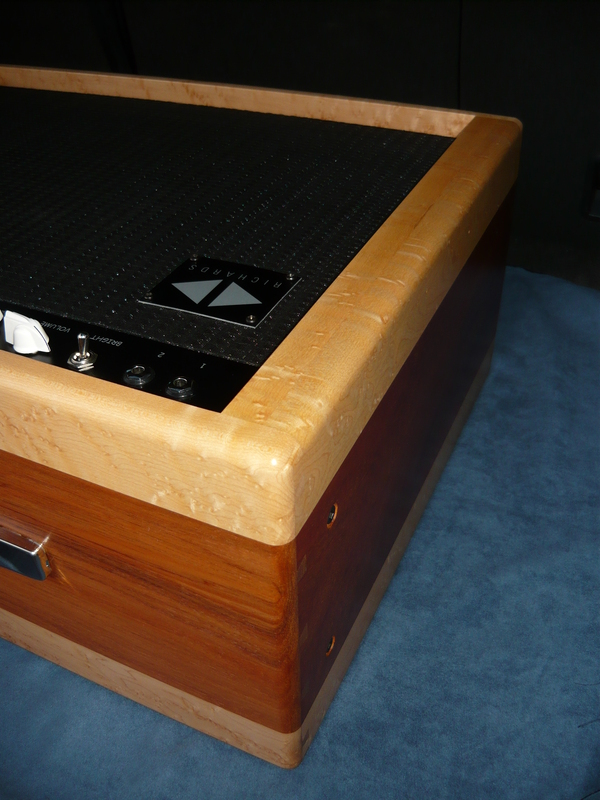 The reverb is warm and lush, not the thin and insipid reverb that we hear in so many commercially made amps nowadays. Naturally, we employ a full size reverb tank, housed within a double bag to minimise coupling from the nearby speaker. The reverb does not add any hum, noise or power supply hash to the dry signal. The sweep of the reverb level control is useable from minimum to maximum – we don’t concentrate the entire sweep of this control into just a few degrees of rotation ! Primarily, this model is designed for transparency, with the added bonus of the warmth and harmonic complexity that only a well-designed valve amp can deliver. The master volume control is intended more to control the gain structure of the amp, and is less about overdriving the preamp easily. In other words, the player can find the desired sweet spot when setting the volume, treble, middle, bass & reverb controls, then set the appropriate playing level with the master. The footswitch jack offers a boost facility for solos, etc, achieved by partially bypassing the passive EQ, ie the tone stack. A robust footswitch pedal is included. The FX Loop is positioned after the master volume, between preamp and power amp and is completely passive to maintain the transparency of the amp design. This will require the use of a professional quality (line level) time delay outboard FX, which offers a high input impedance plus input & output level controls with LED signal level indication. 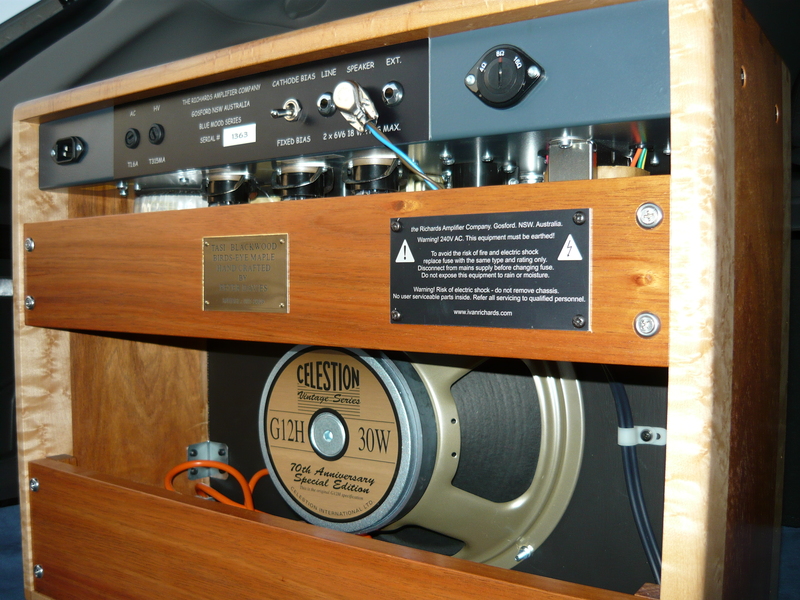 Feedback from Gary so far – well, all of our customers love their Richards amps, but we have never before received such a warm & enthusiastic response as we have over this amp. Gary realises that this amp is making him a better player – the transparent nature of the amp means that it doesn’t hide any mistakes or sloppy playing, so you just end up playing better. The warmth and sheer tone of the amp means that you can play for hours on end and never want to stop. Even Gary’s wife has noticed the improvement. We think we have achieved something extraordinary here ! Well – we will probably only ever build just a handful of this particular model. Our most popular models are the British voiced Expressionist and Rich Tone amps, with good reason, but we have certainly proved a point with the 18W reverb combo. 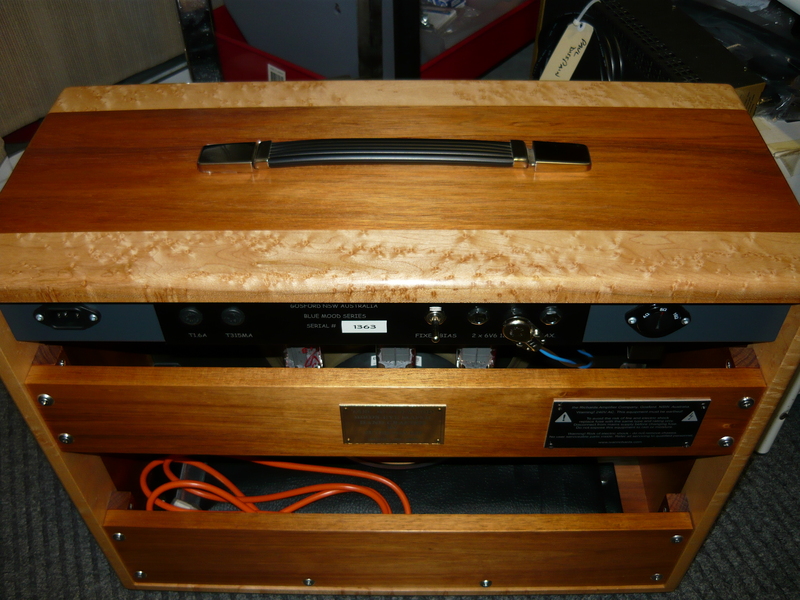 Many thanks to Gary for his enthusiastic response to this amp – IR. This entry was posted on September 22, 2012 at 9:31 am and is filed under Amps, Friends of Ivan Richards Audio. You can follow any responses to this entry through the RSS 2.0 feed. You can leave a response, or trackback from your own site.